If you’ve used Uber, Lyft, Airbnb, oDesk, Kickstarter, or Lending Club, you’ve participated in the Collaborative Economy, ever wondered what’s powering it behind the shiny user interface on the app? The Collaborative Economy is an economic model in which people use commonly available technologies to get what they need from each other. To put some stats on how large the startup ecosystem of companies in this space is, here’s some facts: The Mesh Directory is tracking well over 9,000 startups in this market. These startups are in twelve industries as documented on the Honeycomb 2, and offer P2P or on demand business models that may disrupt traditional companies. They’ve been funded a whopping $11 billion at the time of this post going live, and there’s more money coming. Shareable Resources layer stimulates awareness of idle capacity. The Collaborative Economy enables people to access idle resources that others own, but aren’t using, like cars, offices, rooms, parking spots and more. For example, each Uber and Lyft driver is issued a smart phone that identifies when drivers are available for riders to summon from their own mobile devices. Breather, a high-end workspace available on demand, enables people to quickly find an office nearby that they can rent, based on availability. Yerdle, a marketplace that powers swaps and trades, encourages users to take photos of things they no longer need to help them to exchange them for things they do need. Device and Application layer provide capability for anyone to access resources. Mobile technology is the key platform for local and global enablement. We’re familiar with the smart phone in our pocket or purse, but the location-based GPS technology, ability to host a variety of apps, connect to our credit cards and to display a plethora of information in high-definition graphics make mobile technology the driving force for this movement. EBay and Craigslist are over a decade old. Yet, when they started they were unable to provide real-time sharing, because people did not have smart mobile devices in their pockets like they do now. Developer layer powers multiple systems to connect. An Application Programming Interface enables developers to connect their software to another companies data, software, and more. In the Social Networking arena, we saw Facebook birth an application platform that enabled thousands of new startups to birth their companies on top of the Facebook platform, like RockYou, Slide, Zynga, and more. To date, Uber has launched an API that’s enabled cities, select startups, and large companies to connect to their API, offering instant connections to Uber rides and data, spurring on growth. Expect this to be one of the highest growth levels in this stack, as Airbnb, Lyft, and other players will follow suit, enabling partnerships. Trust layer enables rapid distribution among strangers. Ratings and reviews give providers (those who’re selling goods, services, or offering items for swap) with instant credibility to partakers (those who’re buying the resources) with an instant level of trust and credibility. Lyft drivers rate passengers, and vice versa, to ensure quality service from and for drivers and passengers. Drivers with low scores may be removed from the system. Riders with poor ratings may become ineligible to use the service. Collaborative Economy startups integrate social media features to promote a network of trustworthiness. For example, Airbnb offers Facebook integration, which helps users to find reviews of places to stay from friends they actually know. Social media is being used to promote services like Crowdfunding to advertise the need for investors to back the next digital watch, indie film, or to save a local school program. Data Layer charges the startups with instant scale at low cost. I had the fortune to visit a leading ride-sharing startup. It didn’t take me long to realize that, at their heart, they’re a “big data” analytics company for city-based logistics. Airbnb has told me that they are more like data scientists than a hotel brand. They foster trust that enables people to share within a global marketplace of millions of listings, based on advanced technology-based applications that match hosts and buyers, on demand. There are millions of transactions happening on Crowdfunding platforms. P2P lending platforms, like Prosper and Lending Club, require massive amounts of data crunching to analyze, anticipate, Cloud services enable development teams to quickly scale (up and down) applications, data and storage, based on changing market demand. This makes the time-to-market for startups cheaper, faster, and more efficient than ever before. The cost for startups to get into the market has plummeted, enabling thousands of startups, that would previously have been unable, to enter the market at low cost. Sharing isn’t new, but these technologies birthed at the perfect time. To summarize how these technologies work in context of our society and businesses, let’s look at the broader picture. We’re in a special time in history, where all of these technologies birthed and matured at about the same time in 2008, when the recession was at it’s worst, and people had no choice to turn to each other to get resources to avoid foreclosure, bankruptcy, or to just get food on they table. 15 years ago, Webvan offered food delivery, but lacked mobile devices to enable lower cost transactions from the crowd. Ebay enabled a global marketplace, but due to lack of smart devices, it was difficult to happen in real time at local level like ordering an idle car from Lyft. A variety of internet commerce currencies emerged like Beenz, but lacked P2P block chain technology to enable decentralization. To best understand this space, you must look at all technologies as a whole. 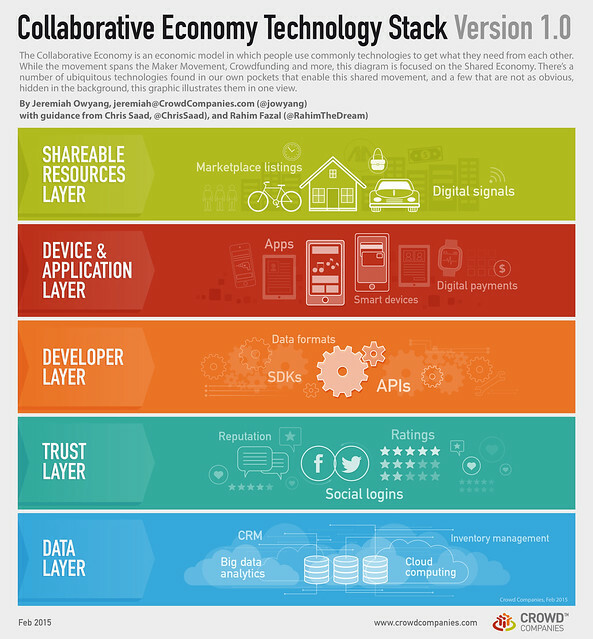 It’s easy to focus on just one aspect of the Collaborative Economy, whether it’s the internet of things, or trust, or mobile devices, but in reality, it’s key we see the entire comprehensive stack as it all works together. Failure to see all the technology parts working together limits understanding and ability to see where it’s headed next. They’re all interdependent. I hope this graphic provides a full look at how all the pieces work, relate, and connect. Technology makes an old human behavior happen at scale. Some people insist that the Collaborative Economy is nothing new, sharing, collaboration, is just being a good neighbor, something my friends in the Midwest pointed out. However, today the difference is simple, technology enables us to scale these sharing and collaboration beyond our immediate trusted neighborhood, now we can be good neighbors to strangers. To sum it up, the Collaborative Economy might be able to exist on some, much smaller, scale without technology. Looking forward, we will see new technologies being added to this Stack. It is the increasingly more rapid advances in technology, like microelectronics, seamless payment systems, wireless connectivity, blockchain that are enabling, advancing and expanding the power of the Collaborative Economy to engage others, using in your neighborhood and around the globe. In particular, I’m pleased that Coinbase has joined our innovation network at Crowd Companies, who’s the leading exchange and digital wallet for blockchain technologies, watch this space carefully. As technology continues to advance, the day is coming when everything and everyone that can be connected to the internet will be connected to the internet – and we are farther down that road than most people think. I’m grateful to the help of two advisors: A very special thanks to Chris Saad (twitter, website), chief architect at Echo, which connects APIs across many social networks for large corporations, and Rahim Fazel (twitter, website) who was a founder of Involver (now part of Oracle) a Social Media Management System which connected social network APIs into a single software platform, both who provided guidance and input into this above graphic.